The first production-specification Detroit Electric sports car has rolled off the UK assembly line and has been exported to China, as the electric vehicle company’s expansion in Asia continues. 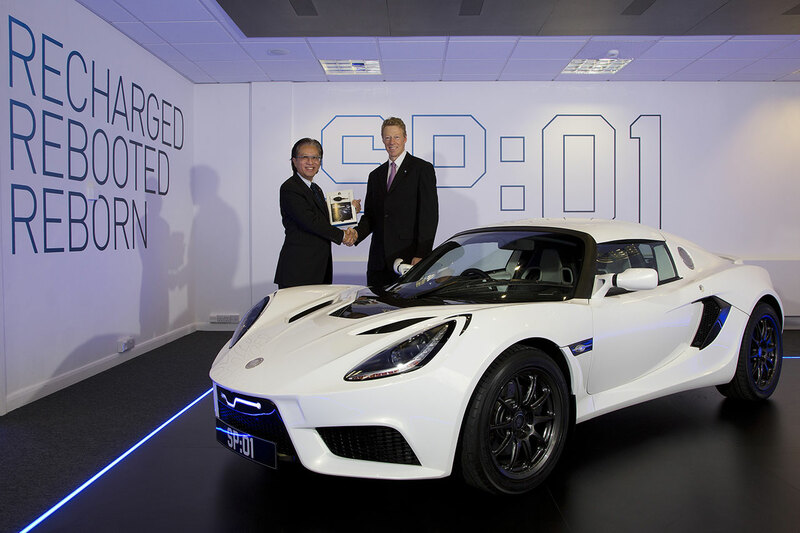 The first SP:01 pure electric vehicle was handed over to Detroit Electric’s new importer for China, Jowett Motors (Asia) Ltd, in a ceremony at the company’s main assembly plant in Leamington Spa, UK. The white SP:01 was presented to Dr Richard Lee, Chairman of Jowett Motors, by Detroit Electric Head of Engineering, Ben Boycott. It will be used as a demonstrator vehicle to fulfil a stream of enquiries from prospective customers that followed the appointment of Jowett Motors last April and the appearance of the SP:01 at Auto Shanghai 2015. This handover of the first SP:01 marks another major step forward in Detroit Electric’s continued expansion and investment in the Asian region, where the company hopes soon to announce the appointment of a distributor for Japan. Commenting on the latest developments in Asia, Albert Lam, Chairman and CEO of Detroit Electric, said: “We are extremely proud to team up with Jowett Motors, a company that has an exceptional track record in the establishment and selling of exclusive, high performance sports cars in the Chinese market. “Jowett Motors’ desire to join us as we prepare for full-scale production and sales of our upcoming range of pure electric vehicles is a huge endorsement of our products and brand, and a demonstration of their confidence in the progress we are making in Asia and around the world,” he added. Jowett Motors’ owner and management team have been importing renowned sports car marques from Italy and Germany to China for over 23 years. Dr Lee said at the handover: “We were honoured and excited to be selected as Detroit Electric importer for China and we are now delighted to receive the first production-specification SP:01. Our many potential customers in China have been looking forward with relish to this chance to experience the SP:01 close-up in our country. “The new SP:01 sports car is a diamond and a collectable item in itself. It has super car look and feel and, of course, it delivers supercar performance,” he added. The Detroit Electric SP:01, the world’s lightest and fastest two-seat pure-electric sports car, goes on sale in Asia and Europe over the coming months. It promises blistering acceleration, reaching 60mph from standstill in just 3.7 seconds (0-100km/h in 3.9 seconds) and a sprint to an impressive top speed of 155mph (249km/h). Featuring a 285HP / 210kW electric motor and carbon fibre body panels, the car is fitted with a single speed automatic transmission as standard, with the option of both twin-speed automatic and six-speed manual transmissions. The SP:01 is supplied with both hard and soft tops as standard. The battery in the SP:01 has been integrated into the chassis as a stressed member, adding stiffness to enhance handling and safety. The military grade, lightweight high density lithium battery is the most energy-dense automotive battery pack in the world, offering over 140Wh/kg, benefitting range while keeping overall vehicle weight low.